The local information website oursouthbank.com was developed by South Bank Employers’ Group in 2014, on behalf of the South Bank Visitor Management Group, a public-private partnership between major organisations in the South Bank and Lambeth Council. Our Public Realm Team oversees the site’s daily updating and communications across regular e-news and Twitter. 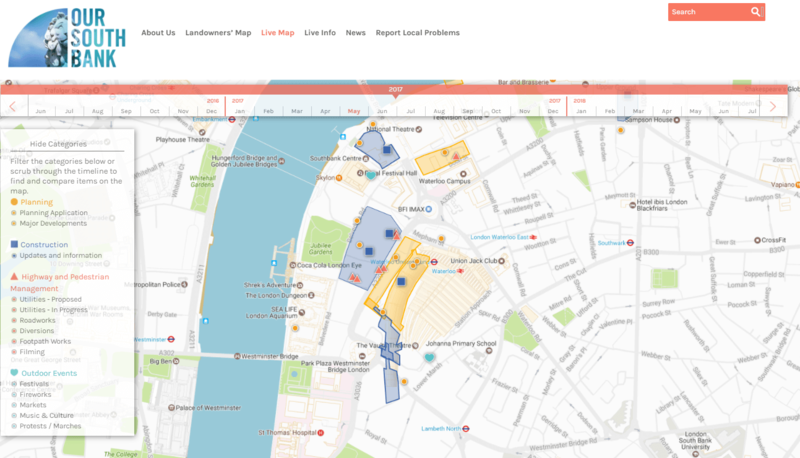 The website is focused on keeping local employers, residents and visitors up-to-date with issues affecting the public realm in and around South Bank, along with a detailed map that highlights the different landowners in the area. The website also provides a handy tool that allows visitors to report on problems such as potholes, graffiti and fly-tipping, in order for these to be acted upon by the Group as swiftly as possible. The website also provides essential, live updates on planning applications, construction, events and highway works affecting South Bank. It aims to respond to the pressures created by the neighbourhood’s attractiveness as a destination, aiming to assist visitors and community members and ensure they enjoy their time in the South Bank. Complementing its online tools and user-friendly interface, the website is optimised for desktop, tablet and mobile use. If you would like to to stay up-to-date with news and events, and get access to special announcements, you can subscribe to the Our South Bank e-newsletter here. You will be one of the first to find out about developments, roadworks, diversions and other important information concerning the South Bank public realm.